A briefcase is a professional’s companion that offers the possibility to a business man to pack his whole life on the go. It is more than a mere accessory for a business man as he sees it as his personal identity. It lugs around all the important documents and immediate necessities of a business man. The briefcase has always reigned supreme in its domain because businesses have always necessitated a bag. It does not only lugs vital important documents, it also keeps them safe, thus free from damages that can result from simply accidents and the rain. It also makes the process of carrying your vital long-life documents easy. So many people have gone up to the extent of defining a man with the type of briefcase that he carries. From old times, it was and has remained a narrow hard-sided box-shaped case or bag that is chiefly used in carrying papers and several other documents. It is equipped with a handle. It is very common to find lawyers using briefcases to carry briefs that they will present to a court, hence the name briefcase. Other professionals and business people often use briefcases to carry important electronic devices such as laptop computers and tablets. Such devices which have become unavoidable in our modern society are quite susceptible to damage thus need proper care and protection. Such safety it requires can only be provided by a quality briefcase. It should be noted that there are three types of briefcases. The first is a portfolio which is a handleless case that is carried under the arm or in the hand. The second is a folio case which is a portfolio with a retractable hand. The third is an attache case often referred to as a diplomatic case. It is a box-style case that is made of leather. It can occasionally be made of aluminium. It is scrunched over a hinged frame that opens into two compartments. This bag was traditionally carried by a diplomatic officer to an embassy. A high quality leather briefcase can likely be very expensive. Its price can range from 150 to 1500 dollars and above. Why are quality bags expensive? What is the difference between a cheap bag and that which cost over a thousand dollars? How can you purchase the best leather professional bag for your professional needs? These are some of the chief questions that are going to be answered in the reviews of men briefcases. How to choose the right briefcase – Hard sided, soft sided briefcase, or Attache? In purchasing the best briefcase for men, make sure it’s formality and style are appropriate for your lifestyle. This you get based on your occupation. If you happen to be an accountant, then an attache case of luxurious leather briefcase would suit you best. If you are often travelling for business, a rolling briefcase would be an outstanding choice for you. For multi situations, a formal or casual messenger type leather briefcase tends to be the best. Although, its prevailing style may change from time to time, both versions remain appropriate for the office. A hard sided briefcase features a rigid, lightweight frame that is made of sturdy plastic, cardboard, or aluminium. In possession of no shoulder straps, it features a handle. 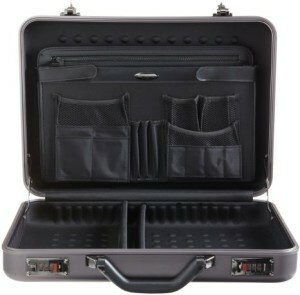 In order to keep items inside the case neat, the hard sided briefcase features dividers and folders. The attache case which is much similar to a briefcase, has a smaller size and slimmer profile that makes it more formal and compact than a traditional briefcase. It has a simpler interior with fewer folders and pockets. The flexibility of space is translated as the number of compartments that the bag has. Briefcases often look deceptively slim and compact. The interiors are often designed with spacious and flexible compartments allowing you to store your laptop and other essentials. However, your primary consideration in purchasing a briefcase should be what you hope carrying in it. In order to have all your briefcase’s containments well organised, it is advisable to go for one that has enough compartments. The best briefcase for men always features several compartments that will permeate proper organisation of your items. The three common colours for the best briefcase for men are tan, black, and brown. It should be noted that brown and dark-brown are best suited for a professional milieu. This is because they immediately project a sense of power and authority. Tan alongside lighter colours are better suited for casual commitments. That is where the working atmosphere is much more relax. They also tend to be the best for informal use. If you have a habit of carrying your laptop so often, make sure the briefcase has a large compartment for this task. A person who regularly transports the same few items might prefer a hard case which does not need to contract or expand to fit its items. If you have plans of often travelling with your briefcase by air, then consider a security checkpoint friendly compartment. A legal secretary or lawyer will benefit very much from the use of a larger briefcase since their duties require them to carry realms of paper. A professional with fluctuating work requirements should always go for a flexible soft-sided case. A flap over briefcase is easier to use, more casual, and weighs less than the traditional briefcase. This is the best choice for men who work in non-formal occupations such as the medial, and fashion industry. When it has to do with the best briefcase for men, you should always expect to pay top dollar for quality. This is because such items can eventually last for decades. However, a less durable briefcase will cost less but will need to be replaced sooner than a more durable and expensive one. The best recommendation is to purchase the highest quality affordable. A briefcase has been and will always be a necessary tool for anyone who transports documents to and from the office on daily basis. The right briefcase is also an important aspect of one’s dressing. The following are our reviews of the best portfolio briefcases and the best folio cases. This briefcase for men was carefully crafted with superior craftsmanship from textured calfskin leather. This handsome briefcase is distinguished in its outfit and rolled top handles. For carrying convenience, it features a highly durable webbed strap and a top zip closure, interior zips, a signature check lining and Smartphone pockets. It is made in Italy. 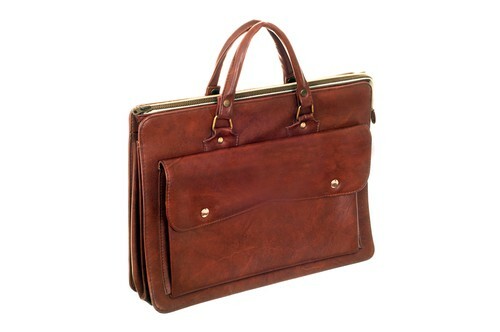 It was made from premium quality leather making it one of the bests Men’s leather laptop bags. It is quite durable and long lasting since it was constructed to withstand the challenges of modern times. In Briefcases for men reviews, it has been starred 5/5 stars. The majority of customers have attested to enjoy the smooth surface, portable size, and clean lines of this briefcase which is outstanding among men’s leather laptop bags. It has a main compartment to safely store laptop or tablets, travel size power cord, and slim writing journal without altering the shape of the briefcase. The bag is loved with or without items inside because of its appealing view. There is no need to prop this bag against something since it can stand on its own. It works in all environments from office to leisure trips. The Glazed Italian Leather perfectly highlights the construction of a well-structured briefcase. It features a locking flap closure, dual interior Gusseted compartments, ID; cell phone pockets, and interior wall. Ease in carrying is provided by an optional durable shoulder strap which can be easily adjusted for fit by any user. It also features a top handle that eases transportation. It is made from high quality leather. In briefcases for men reviews, this item is starred 4.2 out of 5 stars. Several customers find that this briefcase is gentleman like. It features nice organisation. It is well crafted, looks professional and is an eye turner. 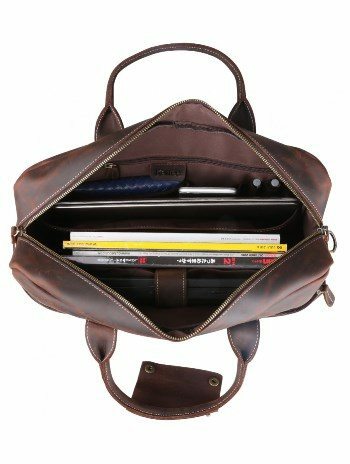 A good number of customers find that this is one of the men’s leather laptop bags that can resist for a life time. It has a beautiful smell, solid stitching, and nice hardware. Contents always remain organised thanks to the organization pocket which is a unique touch. Its adjustable shoulder strap can be removed to be more formal for occasions. These customers highly recommend that you purchase this briefcase as a lifetime bag. However, same with other men’s leather laptop bags, the Gusset also has some weaknesses. Some customers complain of experiencing issues with its hardware. One of the customer report of having to change the first one he bought in a period of just 4 months because the hardware for the adjustable shoulder strap got broken. However, he hopes the second will stay longer because he finds it very great. This briefcase is sprayed by a butterfly zip design that completely opens flat. It is a durable two-compartment functional laptop briefcase that features a compression-molded Tensaerlite laptop sleeve, a plush fleece lining and a magnetic flap closure that is aimed at protecting your laptop. Accessories, cords, and documents can be stored in a super-handy organisational pocket. It has a memory-foam top handle that ensures great comfort when carrying the bag. It features an optional and adjustable shoulder strap and is well lined. In Briefcases for men reviews on Amazon, this briefcase is stared 4.5 out of 5 stars on Amazon. A good number of Amazon customers stared this bag 5/5 testifying that it is just the perfect slim bag to go for. They admit that the quality of this briefcase is excellent and it fits their laptop beautifully well. It features a great strap and has a non-slippery material. The bag’s interior is highly appreciated by most of its consumers since it features around organisational compartments, 4 pen holders and 6 internal pouches. In addition, customers highly appreciate this briefcase because after putting everything, mouse, charger, iPad, laptop, and headset, it still remains very slim. Its weight and removable straps are also appreciated by customers. Some customers find that the super-handy organisational pocket of this briefcase is not as super-handy as it claims to be. This briefcase for men has a Tough coated-canvas construction. For easier travel with this portfolio bag, a smart Add-a-Bag sleeve lets you attach it to the handle of your luggage. It features a two-way zip closure, exterior zip pockets, handles, optional and adjustable shoulder strap a Tumi ID lock that will always help to identify it as your bag should in case it gets stolen or lost. It is made of canvas and a leather trim. On Amazon, the Tumi Alpha 2 Slim Deluxe Portfolio, Earl Grey is starred 4.6 out of 5 stars. Some customers appreciate its perfect size and high quality material. Several customers appreciate to have spent a huge sum of money for a premium quality bag. Some testify haven stopped their daily searches for a business bag immediately they came across the Tumi Alpha 2 Slim. It fits MacBook, laptop cord, mouse, touch bar, and still has extra space. Here comes another good looking and durable bag that falls among men’s leather laptop bags. It is a lightweight briefcase that was crafted by the Vegetable-dyed Italian leather crafts. It is divided into two highly organised compartments that will permeate you safely store your vital items for transportation. It features a removable shoulder strap, a roller bag attachment, exterior gusseted zip pockets and a top zip closure. It fits all 15’’ laptops. In Briefcase for men reviews, this briefcase tends to be highly appreciated by its users for its pretty good looking colour and durability. It is quite smooth and comfortable to carry on the go. It stands out as one of the best eye turner brief cases for men. This briefcase literally took Tumi to the top. The level of craftsmanship used in bringing out this briefcase is exceedingly professional. Such craftsmanship was carefully planned and achieved over years of experience. Glancing at the bag for your first time, you will notice its beautiful 100% leather exterior alongside multiple zip pockets. In addition to a double zip closure, there exist a zip pocket location on both the front and the rear. On the interior of this briefcase, you will find great small touches for staying organised like the key ring and pen loops. It size allows you to fully accommodate 15’’ laptops effortlessly in addition to other accessories you own like headphones and chargers. When it comes to space, this 11.75’’ by 16’’ is very generous. The Astor Regis Slim in order to render the gentleman’s life easier, features an ID tag and an adjustable 18.5’’ shoulder strap. If you prefer to carry the briefcase by the handle, sure you will be happy to know that the strap is removable. In the Tumi Astor Regis Slim is stared 4.3 out of 5 stars. Some customers find that this briefcase is very impressive and features an outstanding design of superior craftsmanship. Even though it is referred to as slim, it features a lot of room for laptop and other essential items of your choice. Some other customers testify that this is the best briefcase they have ever had. For it features enough space for their personal items such as electronics, folders, iPad, and Laptops. Other Amazon customers after purchasing this briefcase complain of it resembling a women’s hand bag. They find the bag wonderful but do not agree with the fact that it falls flat. They attest that when compared to other nice bags they had purchased from Tumi in the past, they were unhappy so returned the bag. 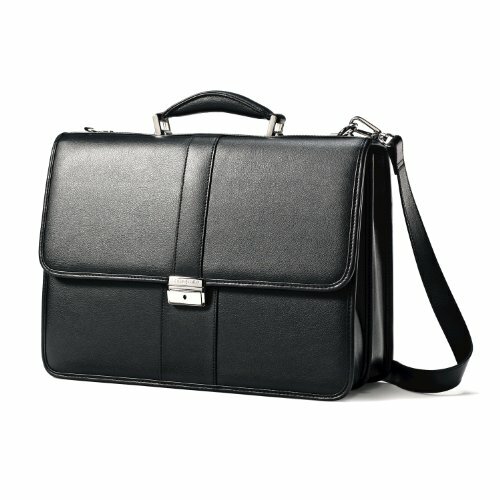 This is a good briefcase for any professional business man who wants a streamlined modern look. Its exterior is made up of 100% genuine leather that provides a serious appearance yet one which is at the same time elegant. The front pocket organizer offers quick and rapid access. However, some men might find that this briefcase is heavier whereas others may not. If you are merely willing to carry extra weight around, then you can be assured to enjoy several years of durability and comfort with this bag. In Briefcases for men review this item is stared 4.2 out of 5 stars for its effectiveness, durability, and comfort ability. A woman rated the briefcase 4/5 stars just by observing her husband using it on daily basis. Other Amazon customers find that the leather used in making this briefcase is stiff thus good quality for a bag that will last. Other customers find that this bag really looks more than it cost. After using it for a while they found that it does not look like a cheap bag. Others find that this briefcase really looks professional and appreciate its look. Other customers after using this bag report that the back is not made with real leather. They complain that they received bags with fake leather in the name of quality leather. Others complain of it lacking water absorbency, and a non-appealing smell. For these reasons a lot of customers tend to be so disappointed by Samsonite. This is another portfolio briefcase for men with a professional feel. Samsonite provides an affordable option for all those who are on budget. Even though the bag is easily affordable, it is still crafted with superior craftsman skills and made of genuine quality leather. You won’t spend the least time rummaging around in your briefcase thanks to its interior organization features, and front pockets. The flap is kept from opening thanks to the simple front clasp. It features a detachable shoulder strap which offers the possibility of carrying the product under your armpit or by the handle. Its padded laptop section will keep all your important electronics free from scratching. Customers were pleased to find out that they could get a professional looking bag at such a price. Complain made include the fact that the briefcase is not really made from high quality leather as it often begins to wear off by the sides. Some customers complain that it is not spacious enough. It starred 4.2/5 and is greatly loved by the majority of her customers for its affordable price and high quality building material. Several customers are happy to purchase a high quality briefcase at a low price. Nevertheless, a few customers complain of their backs wearing from the side not long after purchase. It has a 5 years warranty for manufacturer defects. Below is our review of the best attache cases which are suitable for diplomatic visits and other formal visits as well as professions. 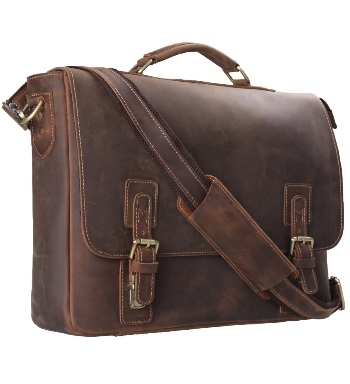 This is one of the best men’s leather laptop bags that is made from genuine leather. This briefcase is unique because it spots the traditional good looks, crafted of genuine leather, and an ultra-organised design. 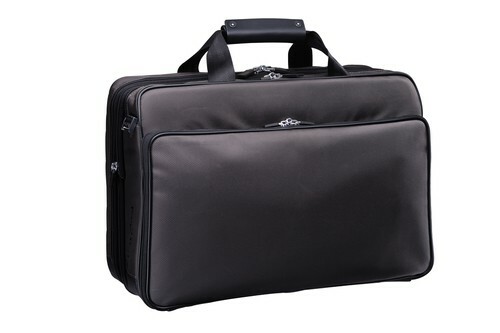 This is an outstanding executive briefcase with durable removable padded spacers that do not only protect but can easily accommodate various sizes of laptops alongside other electronic devices. The briefcase has a fan file pocket and organizer holders for business essentials together with a well secured double combination entry. Worth noting is the fact that it features the quality craftsmanship that is found in more expensive cases. It is the best choice for a professional bag, thanks to its combination of traditional and modern combination. It provides stability and great protection to your important items. It has an organizer section for glasses, phone, accessories, and cards. Its removable padded spacers secure laptops up to 16’’. A 30 days warranty policy holds for this item. This is another briefcase for men that features organizer pockets. It has a removable zippered accessory pouch and corner guard protection. It features a dual combination lock entry. With engraved initials, it looks pretty great. It features an Aluminium shell construction. It has a 5 years warranty. In briefcases for men reviews, a good number of customers appreciate this item for its solid construction, great amount of space, good look, and durability. When you’ve been crafting briefcases since 1938, design and safety becomes a child’s play to you. This is exactly the case with the Zero Halliburton’s Premier briefcase. Just by looking at it, one is easily drawn to its beautiful and attractive anodized aluminium body. This briefcase also delivers big in terms of superior security in order to match the highly attractive eye appeal. It features a strong three-digital combination lock aimed at keeping your personal belongings quite safe. Still for security purposes, it has a thick draw-bolt stay arm hinges. For any rugged adventure, you need not worry because it features a solid textured grip handle. It’s abundant interior pockets that is aimed at keeping all your important items well organised and appealing to the eye. In addition, it also features a smooth and refined leather lining in its interior. This briefcase is suitable for most electronics since it measures 13 inches by 17 and half inches wide. 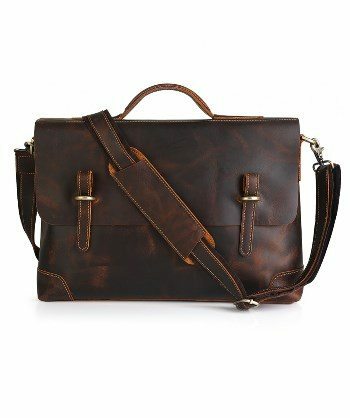 Several Amazon customers after purchasing and using this briefcase for men reported in reviews that it is stylish but does not worth the premium price they paid. They also complained that the inside gasket kept falling out. Some reported to have returned it to Amazon after a series of issues kept popping up. Being one of the most affordable high quality leather attache briefcase in the market today, it also features a dual locking system. Its high security system is aimed at absolutely keeping your documents safe and free from unauthorised persons. It is much more affordable than when compared to its competitors. In addition, it features all the quality you can be looking for in a standard attache briefcase. This attache is very stable thanks to its durable hardware and premium leather. It comes in a classic and simple look yet it is highly stylish and fashionable. It has the ability to expand which is rarely the case with other attache briefcases. It possesses two main compartments and other little divisions which will allow you to safely store your business and professional documents. The compartments are large enough to welcome a laptop of standard size and offering it the necessary protection it deserves. With it, you can be assured that all your documents are well secured thanks to its two combination lock. In reviews of men briefcases in Amazon, this attache briefcase is stared 4.3/5 for its durability, ease of use and appealing look. A lot of customers appreciate the bag for its extra spacious compartment that allows them to carry their laptops, important documents and it still allows free space. Some are quite pleased as they find that this is an excellent attache box to transport their money safely. Some other customers attested positively for its affordable price. Nevertheless, some few customers complained negatively saying that it easily gets hot in the vehicle. 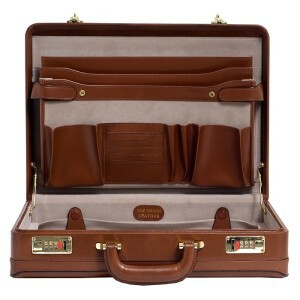 This attache case incorporates smooth and well rounded edges that makes it sturdy, simple, and stylish. It makes the organisation of components very easy thanks to its internal built. It can easily hold a laptop together with other important documents while fully keeping them all safe and free from damage. It possesses a double 3-digit combination lock that will keep all your precious immediate necessities for professional and business use. It has a reinforced handle that allows for long-term hand carry. Its weight is insignificant when compared to that of its competitors thus it is very easy to carry around without stressing up. This diplomatic attache briefcase is highly appreciated by customers in Amazon. They have starred it 3.7/5 for its space, lightweight, ease in carrying and durability. Several customers comment positively saying that this is the right attache briefcase for anyone in search of something that will last long. They also appreciate its design and solid construction. Nevertheless, some customers find that it is a cheaply made brief case and do not agree with the point that it will last long. Using superior craftsman skills, this excellent diplomatic briefcase was crafted from full grain cow hide leather of very high quality. It is a luxurious briefcase that is available in a light brown colour. Its exterior encompasses up to two doubled lined stitching at the centre alongside handle clasps, brass legs, and combination locks. The case’s interior is quite soft and well organised to look at; it is even more luxurious than its outer part. It offers just the right safety required for the transportation of all your documents and electronics needed for service. It is highly appreciated by her customers in Amazon thus starred 4.4/5 for its security, durability and ease to transport. In addition, several customers are praising it for its great design and demonstration of high craftsman skills.